Nowadays, envelopes come in many different sizes, beside the standard sizes. 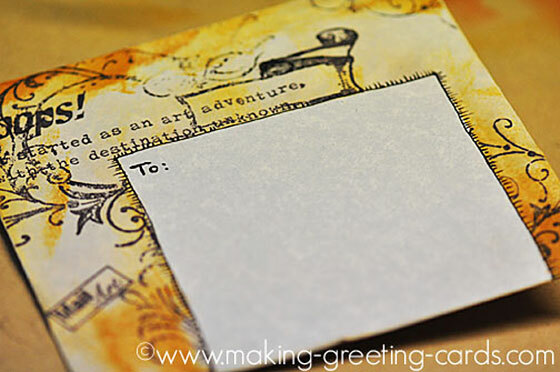 I like to make cards that can fit into a standard size one but there are occasions when I felt more creative and created a non-standard size or shape card. Then I will have to make my own which is very simple and can be done in a snap. Note: Do make sure that you don't decorate too close to the address area as well as the bottom portion since this might cause some delay in the delivery of your mails. Click here to learn how to make them yourself. 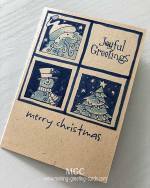 When I first started out making greeting cards, I participated in many swaps and exchanges locally as well as internationally. 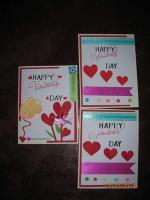 It was fun to receive handmade greeting cards in my mailbox. Swappers not only handmade beautiful greetings cards, tags and trading cards, but also decorated the boxes, bubbled packed pockets and whatever they used to post their masterpieces in. What a joy it was to receive those mails! Below are the many different ways you can brighten up your mails. 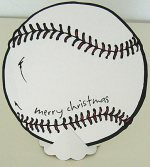 Decorate them with rubber stamp images. Give them a tea or coffee wash to achieve a antique look. Use decorative scissors to trim the flaps. Blow coloured bubbles on them. Ink your rubber stamp using a Versamark inkpad and randomly stamp all over to give a watermark look. 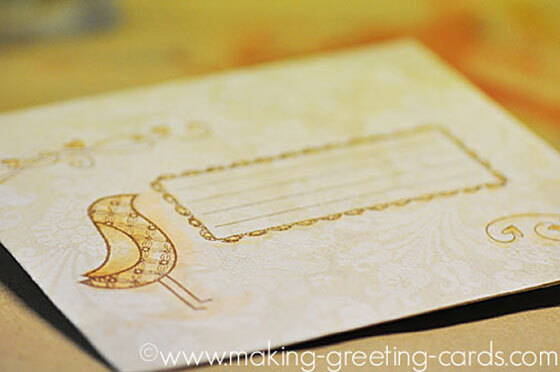 Write the address with calligraphy. Brush calligraphy is the rage now. Anyway, just make your marks! I wish I am able to explain in more detail the various ways you can create this kind of arts. But here are some from the above list. 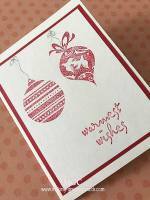 Hope this will help to inspire you to start decorating yours every time you make and send out your cards; be it Christmas cards or a Happy Birthday greetings. 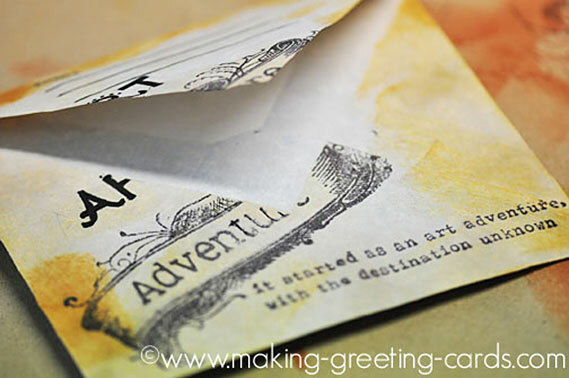 Stamp a frame around the address of the recipient or a image on the left just beside the address portion. After making your tea or coffee, do not throw away the used coffee residues or tea leaves or bags. Take them out before sweetening your beverages. Add hot water and let it steep a while in the water. I usually leave it overnight. Or if you want a stronger stain, use fresh leaves or bag. 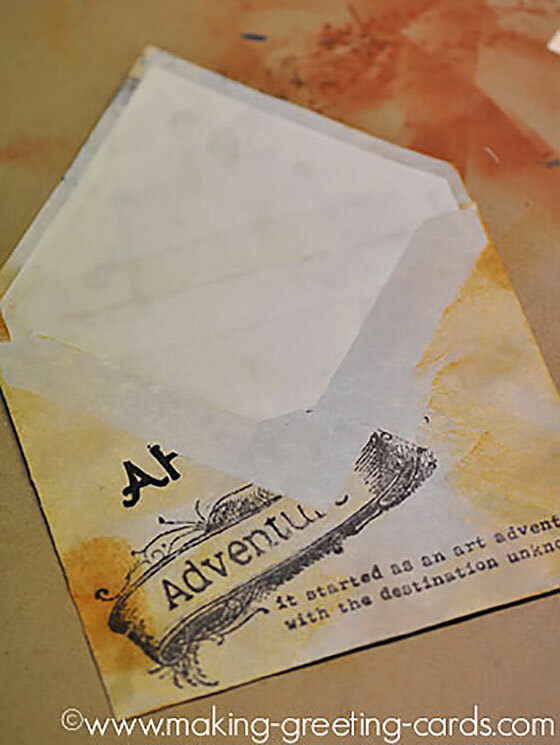 Use a brush and do a wash on the surface of the envelope where you desire. You can also apply some on the bottom of a mug and place it on a corner for a tea or coffee stain look. This is real fun. What you need is a straw, dish detergent and coloured water. Mix one or two colours in containers. Containers should be big enough for the front or back to catch the bubbles. Blow the coloured water with the straw to form bubbles and place the portion where you want to be decorated over the bubbles and the blown bubbles will leave coloured marks on it. When dry, repeat with another colour if desired. Check out this site for their yearly contest.